Many people are having problems with their gardens specifically because they are not nourishing the plants properly through the soil. People who use just any patch of soil without properly nurturing it might be planting their garden in an area that is devoid of nutrients. However, a thorough understanding of the different soil types and how they function can make all the difference for gardeners who are trying to improve their gardens. Compost is defined as decayed organic matter. While compost is decayed, it is usually not going to decay much further beyond the point at which it is received, contrary to popular belief. The chemistry of compost, specifically the low concentrations of nitrogen and carbon, make this possible. As such, adding compost to the mix is not going to introduce an unstable element to the soil. When people try to introduce many other types of organic matter into the soil, they are going to break down fairly readily. Compost has a way of contributing what people need effectively. Many people have heard about all of the environmental benefits of letting old plant matter turn into compost mulch. The compost mulch is going to nourish the soil more effectively than almost any artificial treatment ever could. Compost is broken down by a combination of various microorganisms, and these microorganisms can create the perfect environment for plants due to changes in the soil quality. 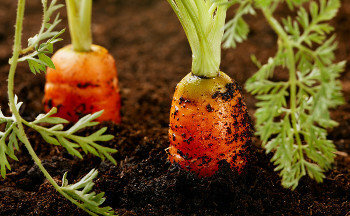 Compost improves the soil quality, allowing plants to thrive. Soil is a mixture of silt, sand, and clay particles. The composition of clay particles in the soil is going to make all the difference due to the chemistry involved. Clay particles are negatively charged. As such, they are going to attract a lot of the nutrients that plants need and that are necessary in order to create a healthy soil environment overall. Calcium, ammonium, magnesium, and potassium are all positively-charged cations, so negatively-charged clay particles are going to manage to attract them easily. Soil that is rich is clay is usually going to be more fertile than soil that has a relatively high composition of silt and sand. Sand particles have no charge, and they’re going to give soil shape without really increasing its fertility levels at all. People can increase the inherent fertility of soil through fertilizer. The fertilizer is going to be highly concentrated when it comes to the nutrients that plants need in order to thrive. These are going to be minerals that plants cannot make on their own through photosynthesis, and that must be absorbed through the soil. Fertilizer can help nourish the plants directly, even as other parts of the soil give it structure and compost improves the health and quality of the soil. Not everyone is going to be blessed with a patch of garden that is going to have enough of a clay composition to naturally supply the plants with what they need. Particularly in certain parts of the world, people are going to be stuck with soil that has a higher concentration of silt or sand. Products like those available through Whittier Fertilizers can help people give their plants what they need in order to thrive in a wide range of different soil types. People can get the organic compost that they need, and they can rest assured that this is the sort of high-quality compost that does not always form naturally.